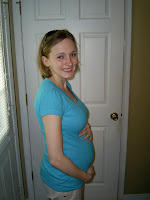 As promised here is picture of the love of my life, Kristy, and the amazing gift of life growing inside of her. And after a late night run for some fruity pebbles, an early morning pancake cook off and enough corn on the cob to feed an army I still have a very happy pregnant wife. I may have exaggerated about the corn on the cob, but as that old saying goes "If momma ain't happy ain't nobody happy". So whatever momma wants momma gets!